In the previous verses of Srimad-Bhagavatam Queen Kunti prayed that the Lord kindly cut off her attraction for her kinsmen, the Pandava and Vrsni families. However, giving up one’s attraction for material things is not sufficient. The Mayavadi philosophers say, brahma satyam jagan-mithya: “This world is false, and Brahman [spirit] is truth.” We admit this, but qualify it. As living entities, we want enjoyment. Enjoyment means variety. It is not possible to enjoy anything without variety. Why has God created so many colors and so many forms? In order to create enjoyment out of variety. Indeed, variety is the mother of enjoyment. Mayavadi philosophers wish to negate this variety, and therefore they are called impersonalists. The human form of life is meant for reestablishing our relationship with God. This material world means forgetfulness of our relationship with God. There is no Krsna consciousness in this material world, for as soon as there is Krsna consciousness, as soon as there is action on the basis of Krsna, there is nothing material. Everything is spiritual. As a woman, Kuntidevi had a relationship with two families. That was her attachment. Therefore she prayed to Krsna to cut off these relationships and free her. But after becoming free, what should she’ do? That is the question. One may be employed in some business and, feeling inconvenience, resign. That resignation may be all right, but if by resigning one becomes unemployed and has no engagement, then what is the value of resigning? Those who are frustrated and confused want to negate this material world. They know what they don’t want, but they do not know what they do want. People are always saying, “I don’t want this.” But what do they want? That they do not know. What they want is actually explained by Kuntidevi. She says, “Let my family relationship cease.” But she further adds, “Let my relationship with You be confirmed.” In other words, she does not want to be attracted to anything but Krsna. This is perfection, and this is actually wanted. We must simply be attached to Krsna twenty-four hours a day without deviation. In this way our renunciation can be perfect, if we think we can be attached to Krsna and material things at the same time, we are mistaken. We cannot ignite a fire and at the same time pour water on it. if we do, the fire will not act. The Mayavadi sannyasis try to renounce this world (brahma satyam jagan-mithya). It is very good to preach renunciation of the world, but side by side we must have attachment for something, otherwise our renunciation will not remain. We see many Mayavadi sannyasis who say brahma satyam jagan-mithya, but after they take sannyasa they return to the material world to open hospitals and do philanthropic work. Why, if they have left this world, considering it mithya, false, do they again return to take up politics, philanthropy and sociology? Actually this is bound to happen, for we are living entities and are active. If, out of frustration, we try to become inactive, we will fail in our attempt. We must engage in activities. In the spiritual world there are kalpa-vrksa trees, which yield whatever type of fruit we desire. In the material world a mango tree cannot supply grapes, nor can a grape vine supply mangoes. In the spiritual world, however, if we take a mango from a tree and at the same time desire grapes, the tree will supply them. This is called a “desire tree.” These are some of the actualities of the spiritual world. In this material world we require sunlight and moonlight, but in the spiritual world there is no need of sunlight and moonlight because everything is effulgent. Everything can be seen by the light emanating from Krsna. In krsna-lila, Krsna stole butter, and the neighborhood friends of mother Yasoda complained. Actually they were not complaining but were just enjoying the bodily features and the fun of Krsna. They told mother Yasoda, “Your son comes to our house and steals butter. We try to conceal it in the dark so that He cannot see it, but somehow He still finds it out. You had better take away all His ornaments because we think the light of His jewels helps Him to find the butter pot.” Mother Yasoda replied, “Yes, I will take off all His ornaments.” But the neighbors would reply, “No, no. It is useless. Somehow this boy has an effulgence that comes out of Himself. He can find the butter even without the ornaments.” Thus the transcendental body is effulgent. The bodily effulgence of Krsna generates millions of universes. In this solar system the sun produces many planets, and due to sunshine the planets are warm and the seasons change. Due to the sun there are trees, green foliage, fruits and flowers. Similarly, whatever we see in creation is all due to Krsna’s bodily effulgence. The Mayavadis simply see the effulgence, which is impersonal. They cannot see anything more. We may see an airplane rise in the sky, but after a while it passes out of our sight due to the dazzling sunshine. The airplane is there, but we cannot see it. Similarly, if we simply try to see the effulgent brahmajyoti, we are unable to see within it. One of the mantras in the Isopanisad petitions the Lord to wind up His effulgence so that He can be seen properly. The Mayavadi philosophers cannot see the personal activities of Krsna nor the planet where Krsna is personally active. Because they do not see the lotus feet of Krsna, they have to return to this material world, despite all their serious penances and austerities. Thus renunciation in itself will not help us. We may artificially renounce, but again we will become so-called enjoyers. Such renunciation and enjoyment is like a pendulum that goes this way and that. On one side we become false renunciates, and on the other we become false enjoyers. The remedy is here, however, if we really want to become detached from this material world, we must increase our attachment for Krsna consciousness. Renunciation alone will not help us. Therefore Kuntidevi prays: tvayi me ‘nanya-visayd. She prays that her attraction be constantly drawn unto Krsna without being diverted to anything else. In this material world there are jnanis and karmis. The karmis are fools who unnecessarily work very hard, and the jnanis are those who, when a little elevated, think, “Why work so hard? So many things are not required. Why accumulate so much money and food and so much false prestige?” The jnani thinks in this way. The bhakta, however, is beyond the karmi and the jnani. Jnana-karmady-anavrtam. The karmi has many desires, and the jnani tries to get rid of all desires, but desirelessness can be possible only when we desire to serve Krsna. Otherwise it is not possible to get rid of desire. As bhaktas, we should have no desires for jnana and karma. We should be without attachment for material things, but we must have attachment for Krsna. In this way our detachment will be fixed. We must cultivate Krsna consciousness favorably. This means thinking of how Krsna will be satisfied. We must always think of Krsna, just like the gopis. The Krsna consciousness of the gopis was perfect because they had no other desire but to try to please Krsna. That is perfection. Therefore Caitanya Mahaprabhu recommends: ramya kacid upasana vraja-vadhu-vargena ya kalpita There is no better process by which to worship the Supreme Personality of Godhead than that method adopted by the gopis. The gopis had no desire other than to satisfy Krsna. All of the gopis tried to satisfy Him, including the elder gopis, Yasoda and her friends, and so also did the elderly gopas, Nanda Maharaja, Krsna’s brother and His friends of the same age, the boys and girls of Vrndavana. Everyone tried to satisfy Krsna-even the cows, the flowers, the fruits and the water in Vrndavana. This is because everything in Vrndavana is spiritual; nothing is material. We should understand the difference between spiritual and material. Material means “no living symptoms,” and spiritual means “all living symptoms.” Both the trees in the spiritual world and those in the material world are living entities, but in trees here the living symptoms are absent. A human being is also a living entity, and the devotees in the spiritual world are also living entities, but in the human beings who are not Krsna conscious the real symptoms of life are absent. Actually there is no other consciousness but Krsna consciousness. And that consciousness is spiritual. Thus even while in this material world if we simply increase our Krsna consciousness, we will live in the spiritual world. If we live in the temple, we live in the spiritual world because in the temple there is no business other than Krsna consciousness. There are so many engagements carried out for Krsna. Those who strictly follow the regulations of Krsna consciousness actually live in the spiritual world, not the material world. We may think we are living in New York, Los Angeles or elsewhere, but we are actually living in Vaikuntha. It is a question of consciousness. A bug may sit on the same seat with the spiritual master, but because the spiritual master has developed consciousness and the bug does not, they are different. They may be sitting in the same place, but the bug remains a bug, and the spiritual master remains the spiritual master. The position in space may remain the same, just as we may remain in the material world or the spiritual world, but if our Krsna consciousness is strong, we are not in the material world. Thus renunciation by itself, the simple giving up of worldly things, is not sufficient. Renunciation may be a helpful process, but it will not help absolutely. When we increase our attachment for Krsna, our renunciation will be perfect. As we increase attachment for Krsna, attachment for this material world will automatically diminish. Attachment for Krsna and the material world cannot go hand in hand. if a woman is attached to two men-her husband and her paramour-she cannot maintain her attachment for both. Her attachment will increase for her paramour. Although she may work at her husband’s home very nicely, her mind will be attached to her paramour, and she will think, “When will I meet him tonight?” In the same way, if we increase our attachment for Krsna, detachment or renunciation of this material world will automatically come. Thus Kuntidevi prays to Krsna that He may grant her His mercy by which she can become attached to Him. We cannot increase our attachment for Krsna without Krsna’s mercy. We cannot become devotees without Krsna’s mercy; therefore we simply have to serve Krsna, for by service Krsna is satisfied. Krsna does not require anyone’s service, for He is perfect in Himself. However, if we give Him service wholeheartedly and sincerely, then, by His’ mercy, we will make advancement. Sevonmukhe hi jihvadau svayam eva sphuraty adah. God will reveal Himself to us. We cannot see God with these blunt eyes. How then, can we see Him? premanjana-cchurita-bhakti-vilocanena santah sadaiva hrdayesu vilokayanti. We have to smear our eyes with the ointment of love; then Krsna will reveal Himself. Krsna will actually come in front of us. When Dhruva Maharaja was undergoing penance and meditating upon the form of Visnu within his heart, the Visnu form suddenly disappeared, and his meditation broke. Upon opening his eyes, Dhruva Maharaja immediately saw Visnu before him. Thus Krsna is there. Like Dhruva Maharaja, we should always think of Krsna, and when we attain perfection we will see Krsna before us. This is the process. We should not be too hasty. We should wait for the mature time. Of course, it is good to be eager to see Krsna, but we should not become discouraged if we do not see Him immediately, if a woman gets married and wants a child immediately, she will be disappointed. It is not possible to have a child immediately. She must wait. Similarly, just because we engage ourselves in Krsna consciousness, we cannot expect to see Krsna immediately. But we must have faith that we will see Him. We must have firm faith that because we are engaged in Krsna consciousness we will be able to see Krsna face to face. But we should not be disappointed. We should simply go on with our Krsna conscious activities, and the time will come when we will see Krsna, just as Kuntidevi sees Him face to face. There is no doubt about this. Kuntidevi addresses Krsna as madhu-pati. Krsna has thousands of names, and the name madhupati indicates that He killed the demon Madhu. Krsna consciousness is likened to a river, but not an ordinary river. 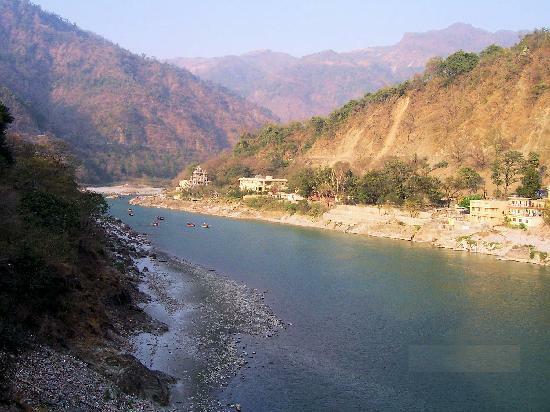 It is like the River Ganges, which is very pure and directly connected to Krsna. Kuntidevi prays that just as the River Ganges flows toward the sea, her attraction will flow incessantly to touch Krsna’s lotus feet. This is called ananya-bhakti, unalloyed devotion. Thus Kuntidevi prays that her attraction for Krsna will flow without hindrance. This should also be our prayer.